If you have questions or want to learn more, please contact us. 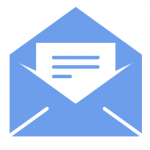 Feel free to give us a call or send us an email. We’d love to hear from you! The Child Study Centre Labs are located on the ground floor (shown as “G” on the elevators) of Sidney Smith Hall. If your child has an appointment to participate in a study for us, free parking will be provided. 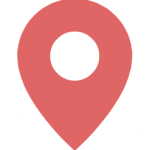 The experimenter for your particular study will let you know where to meet. See below for more information on where we are located. The closest subway station is St. George Station which can be accessed by Line 1 – Yonge-University and by Line 2 – Bloor-Danforth. You can either exit the subway station via Bedford Road or St. George Street exit. The St. George Street exit is closer, however, if you will need the elevator, you will have to exit from Bedford Road. From the Bedford Road exit, you will go South towards Bloor Street West. 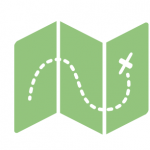 Turn right (head West) and walk along Bloor Street West until you reach St. George Street. Turn left (head South) onto St. George Street where you will find our building on the right (see map below). From the St. George exit, you will go South along St. George Street until you find our building located on the right (see map below). The closest bus stop is located at the intersection of St. George Street and Harbord Street which is run by the 94 bus. The 94 bus runs from Ossington Station along Harbord Street which becomes Hoskin Avenue, around Queens Park Crescent, and along Wellesley Street until it goes to Castle Frank Station: If you are coming from the West, you will be on the East 94 Wellesley Towards Castle Frank Station and you will get off at the stop, Harbord Street at St. George Street. 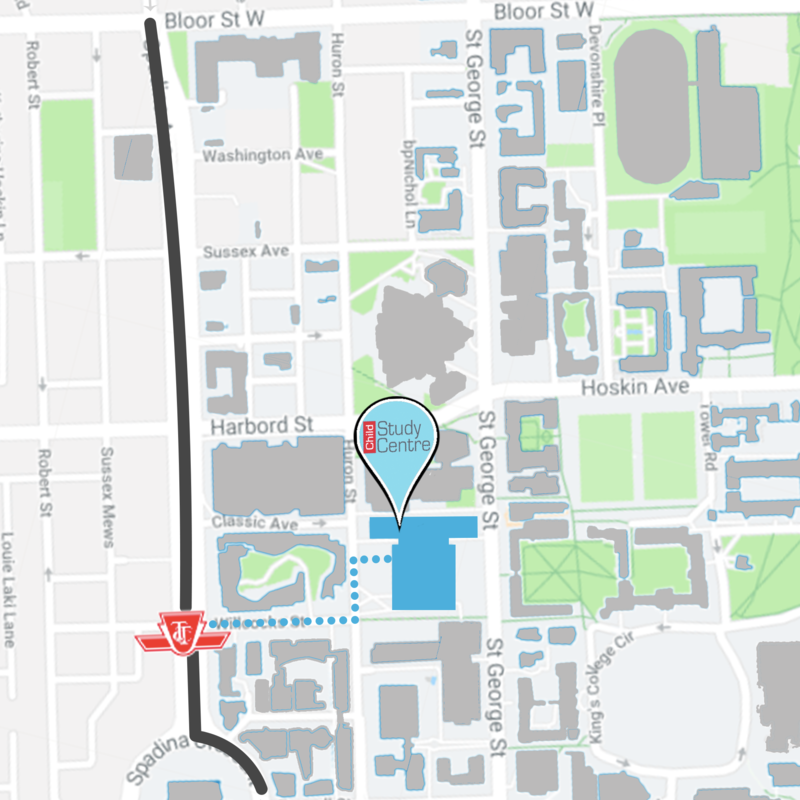 From the bus stop, you will go South on St. George Street where you will find Sidney Smith Hall on your right (see map below). If you are coming from the East, you will be on the West 94A Wellesley Towards Ossington Station and you will get off at the stop, Hoskin Avenue at St. George Street. From the bus stop, you will cross the road towards Harbord Street (heading West) and cross the road again heading South on St. George Street. You will then keep walking South along St. George Street until you find Sidney Smith Hall on your right (see map below). The closest streetcar stop is located at Spadina Avenue at Willcocks Street which is run by the 510 Spadina (Southbound towards Queens Quay or Union Station, and Northbound towards Spadina Station). The streetcar stop is located in the middle of the road with it’s own lane. From the streetcar stop, you will head East along Willcocks Street. 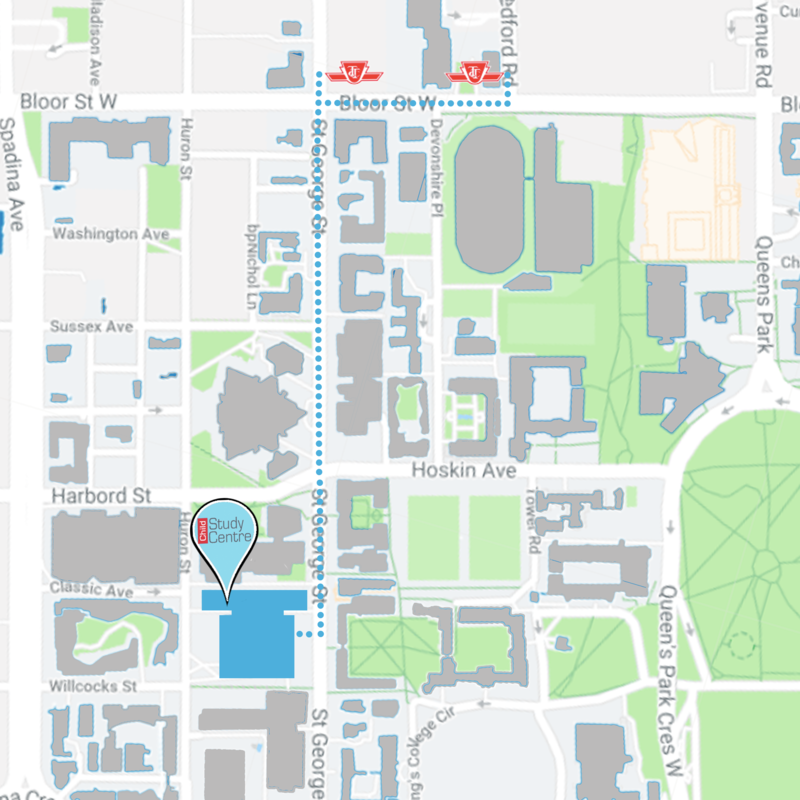 When you reach Huron Street, you will make a left turn (heading East) where you will reach Sidney Smith Hall on your right (see map below). Our parking area can only be accessed from St. George Street. If you are arriving from Bloor Street, turn onto St. George Street, and head South. If you are arriving from College Street, turn onto St. George Street, and head North. If you are arriving from Harbord Street, head East towards Hoskin Avenue and turn right onto St. George Street to head South. 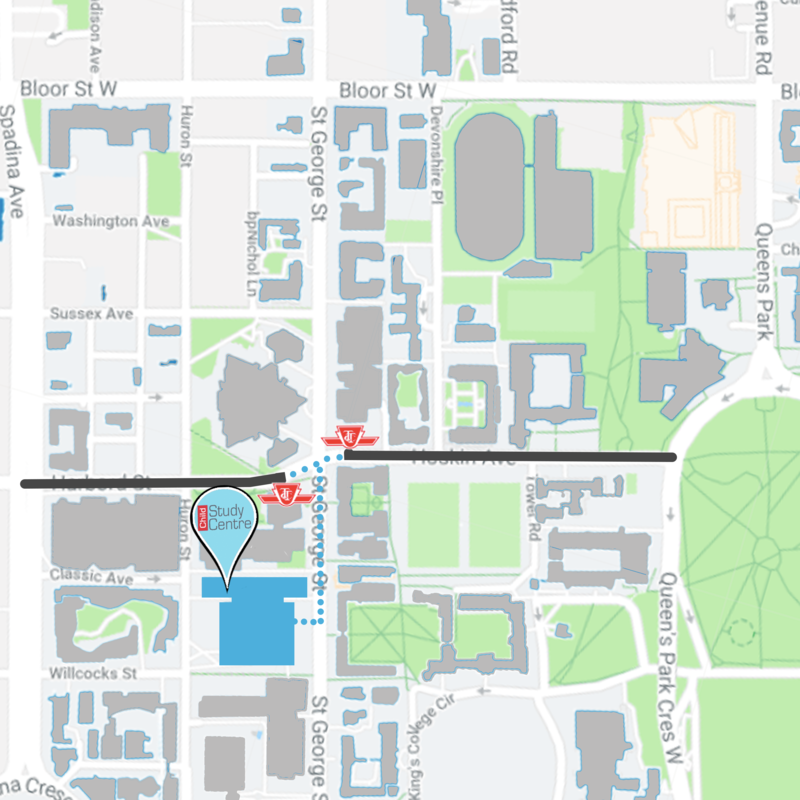 Our parking is located at the bottom of the ramp on the North side of Sidney Smith Hall (see below). Parking in this area requires a permit that must be reserved prior to your appointment, so please let us know in advance if you will need parking. If you are arriving from St. George Street, you can enter from the main entrance doors on the East side of the building. An accessible entrance is located on the South side of the building where a ramp is located which will lead you into the Sidney Smith cafeteria. If you are arriving from Huron Street, you can enter from the main entrance doors on the West side of the building. An accessibility ramp is located directly to the left of the stairs (see below).